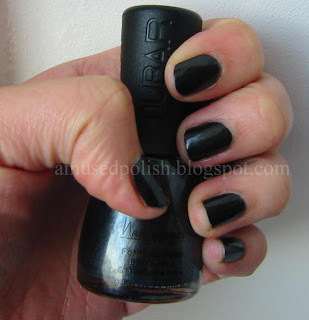 Todays post is about Nubar Dark Castle which was I got along Night Sparkle and a few others to review. As you can see in the pictures below that I'm back to short nails- they peeled on my pointer and ring-finger and I had to file them down so I figured this was the best opportunity to try Dark Castle (this and because I think dark/vampy colours are better on shorter nails than long ones). Maybe that was the payback for not wearing any polish during my vacation in february (I didn't even bring a basecoat there). About the polish: I really love it! It painted one coat and it was a bit on the thicker side but nothing a thinner can fix. After thinning it, I had no problems at all. The colour is black with a gunmetal touch or a black creme with a hint of silver, depends on how you see it ^^. In the bottle it is more silver-ish than it is in real life. Let's move on to the pictures, shall we?